Links lead to Amazon.com for more details, price, and purchase info. 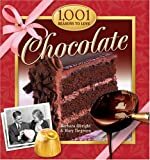 click here for CHOCOLATE COOKBOOKS (new section). Stewart, Tabori and Chang, 2004. 320 pp. North Point Press, 2005. 304 pp. Icon Health Publications, 2003. 344 pp. Abrams Books for Young Readers, 2002.
by Christian Teubner, Leopold Forsthofer, Silvio Rizzi, Sybil Grafin Schonfeldt, Karl Schumacher, Eckart Witzigmann. Book Sales, 2004. 240 pp. A detailed natural history of the cocoa tree. by Astrid Nehlig, PrasadChandan, Ph.D.
CRC Press, 2004. 224 pp. Broadway Book, 2000. 384 pp. A history of chocolate with full color photos and illustrations detailing the natural history, and morphology of the many species of cocoa found all over the world. There is a chapter on chocolate tasting, and many savory recipes of South American dishes combining chocolate with its natural partner, capsicum. Royal Society of Chemistry, 2000. Geared for professionals, and anybody who wants to understand the properties of chocolate so you can make a better chocolate.